JINMO says "Hakai seyo! (Destroy!)". 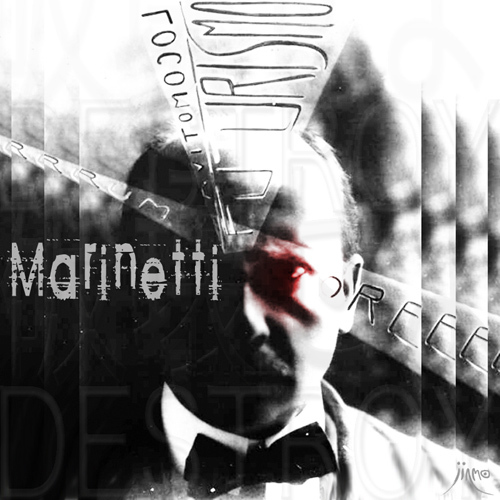 Inspired by Filippo Tommaso Emilio Marinetti's "Manifesto Of Futurism (1909)". This album is the most dangerous one of JINMO's works. this album will function as a dynamo or an anthem. 1. We want to sing the love of danger, the habit of energy and rashness. 2. The essential elements of our poetry will be courage, audacity and revolt. 3. Literature has up to now magnified pensive immobility, ecstasy and slumber. We want to exalt movements of aggression, feverish sleeplessness, the double march, the perilous leap, the slap and the blow with the fist. and revive 100 years later! Do not miss it, JINMO's dangerous hard techno! during the class or labor! and part from yourself until yesterday now so far from now on! I dedicate this album to Filippo Tommaso Emilio Marinetti and YOU!!!!!!! !